Every summer, coaches at high schools around the country start the rebuilding process with their teams. 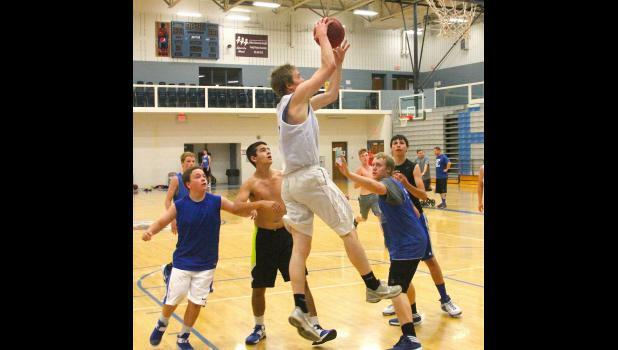 It’s no different for Ryan Noel and the Holton boys basketball team. Gone to graduation are a number of key players from last season, including two prolific scorers (Garett Beecher and Trey Tanking) who will be taking the next step competitively in NAIA basketball. “Team-wise, we’re just going to look a little different maybe than we did last season. We’re replacing a lot of good young men, but also a whole bunch of minutes and points if you look at the measurables,” Noel said. Through team camps and summer leagues, though, coach and players can start to fit the pieces together again and that’s just what the Wildcats are doing. With some alterations being implemented to make up for the missing pieces, Noel said the new team may take a different shape in the coming high school season and he is already starting to see that in the summer. Participation is also something the coach has been pleased with, as Noel noted every player that committed to coming out for the 2015-2016 season attended the team camp in the first week of June. Additionally, Noel noted the Wildcats were just a few players short of their goal of having a freshman, JV and varsity squad playing in summer league competition. Holton currently has a freshman group playing in a league in Seneca and a varsity group playing in the Kaw Valley (Rossville/St. Marys) summer league. Those opportunities for the HHS players are important for two reasons, according to Noel, because they give both the individual and the team valuable experience and time to find their identity. At the same time, the players will face some adversity that will help forge those identities. For instance, the Wildcats have already dealt with numerous injuries over the course of the summer, with Bryson Patch seeing limited action because of a hip contusion this past week and Will Wright just recently returning to action after recovering from a hamstring injury suffered in the spring. “Those things put the other players in spots where they have to step up and play and I’ve really been pleased with a lot of them and their effort,” Noel said. Noel is aware of all the different commitments athletes have in the summer and he noted he tries to work around them. June may be a busy month for his players, but he noted he tries to wind things down in July to give them time to recharge for the fall sports season. At the same time, Noel said he allows for his athletes to be as busy as they want, but knows that a little time spent on the basketball court will go a long way in the winter. Competition in the summer gives both the coaches and players a chance to evaluate where they are at and what they need to work on going forward and Noel said he has seen that from the Wildcats. While the team can re-use some strategy from the past season, Noel said he will change the script a little bit like emphasizing post play and limiting opponents’ possessions on the defensive end. From what the coach has seen so far, he is optimistic about the players’ ability to handle those roles and the potential of the team as a whole this season, especially given the scrappiness he has seen from the Wildcats in summer league action. Team members playing in the Kaw Valley summer league for Holton include Patch, Wright, Sam King, Mason Barta, Kaden Brandt, Brandt Rose, Austin Frakes, Aaron Bain, Riley Strader, Carson Meerpohl, Mason Strader, AJ Haussler, Mason Chanay and Dylan Aeschliman. The Wildcats are currently 3-3 in the league. Holton is holding its own in the league with the likes of teams from Onaga, Rossville, Wamego, Lyndon, Silver Lake, Wabaunsee, Rock Creek, Osage City, Jeff West, Council Grove, Burlingame, St. Marys, Santa Fe Trail, Mission Valley and Royal Valley. While there may not be a summer league championship, as Noel put it, that’s kind of beside the point. Just remaining competitive and seeing what that brings out of the players, something very different for each from what Noel has seen, is a benefit to Holton. “I would say that we don’t have two players on our whole roster that have the same strengths and weaknesses within their skill set. Finding out where they fit, finding where they contribute, I think that’s really kind of why summer is important for us,” Noel said. The Wildcats will conclude Kaw Valley summer league play on Monday, July 6.